Mohja Kahf is a Syrian-American poet, academic and cultural critic. She has been writing poetry since the 1990s taking up a variety of topics. 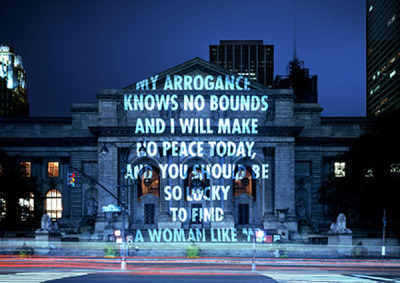 Her poems have been numerously republished throughout the Internet, projected on public buildings, pictured, illustrated in photosets, reduced to inspirational and motivational quotes and performed at many charity events. There are many roads that lead to the poems by Mohja Kahf: the inspirational and motivational quotes on Twitter, liked and/or shared, pictured poems or photosets that readers created, audio recordings, YouTube documented poetry readings and last, but not least, word-to-mouth recommendations. 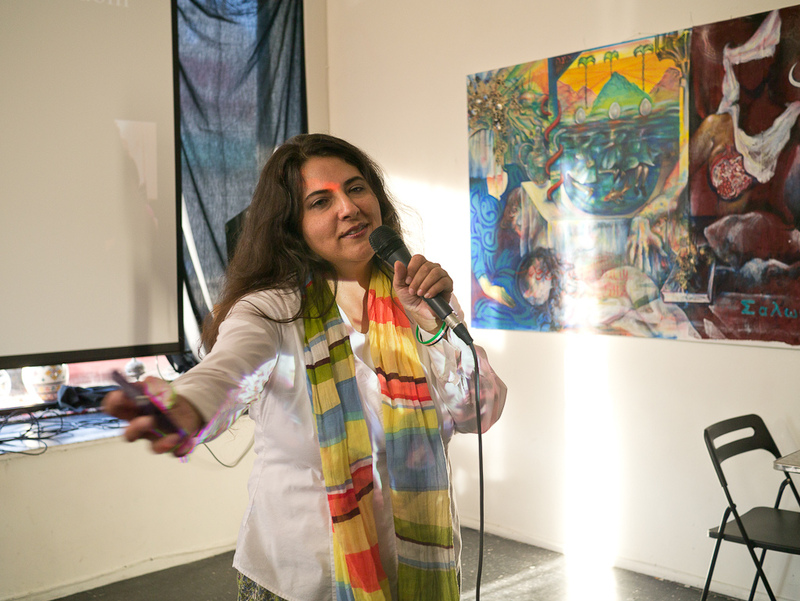 Mohja Kahf reads from her work at a benefit performance as part of an initiative to raise funds (July 16, 2012). Mohja Kahf (b. 1967) came to the U.S. in 1971 from Damascus, Syria at an early age. From what we seem to know, her young parents opted to leave Syria to continue their studies abroad. Kahf’s family had strong anti-regime ties. Her grandfather, a member of the Syrian parliament, was exiled from Syria in the late 1960s. Her father was a member of the banned Muslim Brotherhood. Her mother had learned nonviolent social change and personal spiritual transformation with Laila Said, an influential speaker and peace activist from Damascus. (Mohja Kahf, “Syria’s revolution of love.“) As a teenager Mohja Kahf lived briefly in Iraq, during her sophomore year in college in Saudi Arabia. (Drake). Mohja Kahf is a member of the Syrian Nonviolence Movement. She marched against the U.S. war on Iraq and was an early signatory of the U.S. Academic and Cultural Boycott of Israel. (CNN). With many other engaged US celebrities – Slavoj Zizek, Norman Finkelstein, Noam Chomsky and others she had been fasting a day to protest against starvation in Syria and called to end the blockades. The poet and scholar-activist has been reading from her poetry at many charity events. The Context. The historical Scheherazade uses the art of storytelling to keep Shehrayar, the sultan, interested enough in her stories to postpone her death. The art of storytelling becomes an art of resistance. New Jersey. I tell stories for a living. Them to still the beast of doubt in him. The contemporary Scheherazade tells stories hoping to be engaging and persuasive enough to make a difference. Kahf’s “draws sharp, funny, earthy portraits of the fault line separating Muslim women from their Western counterparts.” (MacFarquhar). it is from you I fashion poetry. On the one hand, it is an unassuming way to define her mission as poet. On the other hand it is a statement on the importance of the “stenographers” and “hungry transcribers” (as it says in the poem) with creative talents: They give those “marvelous women” their voice. 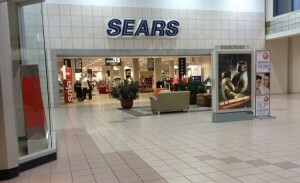 Image: Sears – Midway Mall (photo by Mike Kalasnik). Sears (officially Sears, Roebuck & Co.) is an American chain of department stores. It is mainly known for its appliances, hardware, and clothing. The context: The U.S. Department store is the setting of a poem that talks about a Muslim grandmother trying to meet a ritual prescribed by her religion. you’d make wider washbins, anyway. Considered in isolation these last lines are, technically, direct speech, suggesting that the grandmother justifies her seemingly disconcerting use of the basin with an excuse, the fact that there were not wider washbins. On a textual level it is reported speech: the granddaughter reporting what she suspects her grandmother would have thought in this specific situation. Thus Kahf provides for a third perspective, that of an “implied“ reader who respects the concept of diversity and is prepared to take it seriously all the way down to its pragmatic consequences. Image: “Love the way she do the hijab“, pinned by Toka Abo Shouk on hijab fashion. Many women wear the hijab, or headscarf, reflecting the call in the Koran for both men and women to “cover and be modest”. While the shawl makes a religious statement, it has also become a fashion accessory. The Context: “It is my crown and my mantle, my vestments of grace. Its pleasures are known to me, if not to you.” (“West, Mideast Dichotomy in Veil Debate“). To veil or not to veil: that is however here not the question. “Hijab Scene #1“ is a three-liner. The setting is the homeroom of a tenth grade. Boy meets new Muslim girl. Again Kahf offers three perspectives: the 15 something old classmate with the light blue hair plus tongue rings who finds the way the new Muslim girl dresses “strange”, the girl with the Hijab who remains silent and – as third perspective – a “secret observer” who remains unseen. He or she might conclude that “different“ would possibly be a better linguistc choice. to finish out another pink-collar temp pool day. When asked about the order of the “Hijab scenes” – the published sequence being #3, #5, #7, #1, #2 – Kahf told a critic that the pieces were written in the numbered way but later placed sporadically throughout the book. (Abdelrazek) “Hijab #7“ was presumably written after 9/11, when the fear of terrorism had led to an increased hostility towards Islam and an unsubstantiated anxiety in some parts of society. reserving a seat on a flight? “Hijab #7″ is a one-sided dialogue. There is no real, sensible situation or person. Her anger seems to be directed to some indefinite collective. After we got out of the store, we looked at each other and we said, ‘Do you suppose people look at us like the way we just looked at the Amish?’ And we looked at each other and said, ‘Yeah, I guess that’s how people look at Muslims, especially [because] we were both women who both wore hijab (the Islamic headscarf), and that was sort of a revelation. The context: The title suggests a mythological reading. 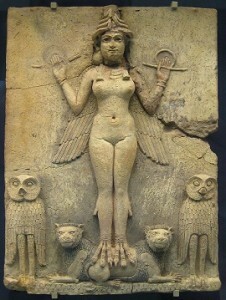 Ishtar is a complex deity with wide-ranging attributes. For a non-expert in Assyrian mythology it is not easy identify fragments of the myth in the poem and associate them to their meaning in the text. The poem is however accessible without insider knowledge. In the last part of the poem the initial optimism is somewhat migated: “you shall be lucky” to have a woman like me is turned into “you should be lucky”. The context. In contrast to an unbeliever, a person who does not believe in a particular religious faith, a disbeliever is a person who is always ready to doubt or question the truth or existence of something. Kahf’s “Disbeliever” is a personal statement on mass casuality terrorism at the turn of the millenium. On January 11, 1998, unidentified gunmen entered a movie theater and a small mosque in Sidi Ahmed near Algiers and massacred 120 men, women, and children at close range during Algeria’s ongoing civil conflict. The poem is written in the form of oath, a formally affirmed statement to keep a promise. There are some general elements to it: a solemn appeal to anything sacred, the determination to keep a promise, the contents of the promise, and witnesses who will testify to the oath. The witnesses are the public, the readers. Reading the poem aloud is like sharing an inner vow not to forget the innocent people, civilians, who became victims of actions which they were not responsible of. 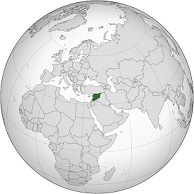 Image: Since March 2011, Syria has been embroiled in a non-violent revolution followed by a crackdown that led to a civil war with Syria becoming one of the most violent countries in the world. The context: “Hatreds based on class and sect would diappear, along with political prisons and electric torture-prods”: That was how her narrator imagined a new Syria before 2011. 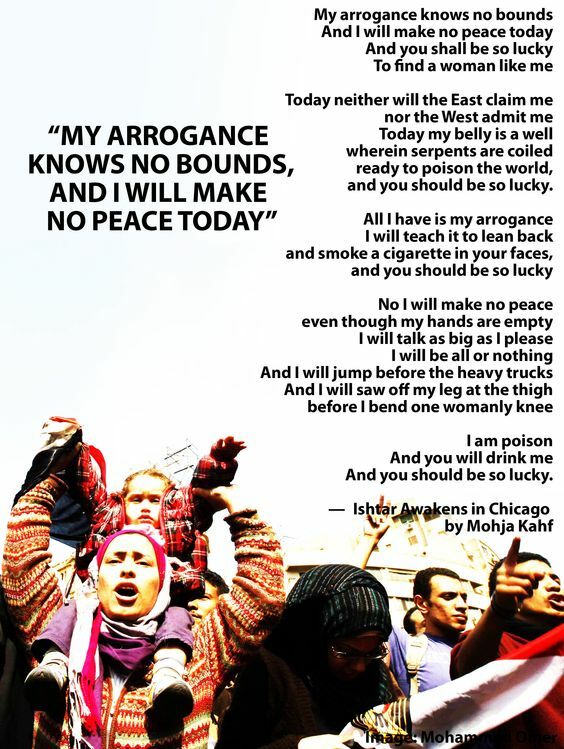 Since 2011 Mohja Kahf writes poems which might be labelled political. Bringing poetry and politics together is a tricky thing. It is like walking on a tightrope. Poetry and politics are not mutually exclusive. But bringing the two together is not easy. To put it laconically: Politics is based on concrete identifyable situations, whereas poetry lives from ambiguity. If political considerations prevail poems risk to degenerate into political propaganda; if poetical expressions prevail the political statement risks to become obscure. Kahf’s venture into the field of political poetry is accompanied by blog essays. Then and Now, her essay on the Syrian Revolution, is about “(the) young non-violent resistance and the ensuing armed struggle” (subtitle). For her, Muhammad Abdulwahhab, an ordinary Syrian, embodies its spirit: “I am a human being. Not an animal. A human being,” Muhammad Abdulwahhab was reported to have said on June 14, 2011, when he spoke into a microphone, probably the first time in his life. “That existential awakening, echoed by people across Syria, is the essence of the Syrian uprising“, so Kahf said. 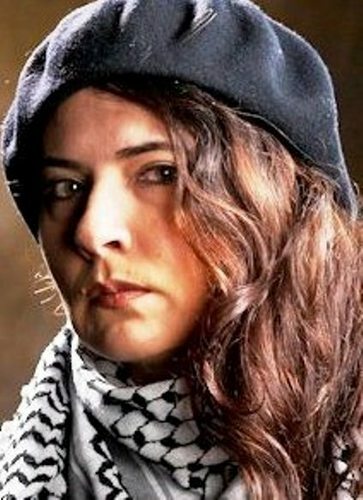 Her poetry focuses on moments that had an great effect on the Syrian people: the self-immolation of the Tunisian street vendor who became “the spark that lit the spark”, a Syrian martyr, Ghiath Matar, whose legacy is still living on, the struggle ″to keep the revolution clean”. Story. The action of the young man sparked a wave of popular uprisings. Observers hailed the incident as the onset of an “Arab Awakening“. as dank and sick as sanctions. And then there was Bouazizi, the 26-year-old Tunisian man who, “half existing”, suddenly became an icon of hope. Bouazizi’s suicide was not the trigger. There were many factors that contributed to the uprisings across the region: demographic changes, removals of food subsidies, changing geo-strategic patterns, etc. 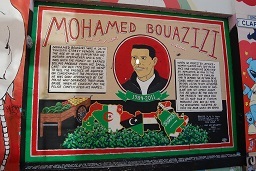 Bouazizi, so the poem says, had no political ambitions: He did it “not for Tunis or the nation/or me, or Liberation (he dit it) for himself, his human self.“ His aunt Radia Bouazizi is reported to have said that his dream was to save enough money to be able to rent or buy a pickup truck. Bouazizi supported his mother, his uncle and two of his siblings. He could not have predicted that with him a revolution would begin from the small provincial town of Sidi Bouzid, a desolate place 265 kilometers south of the capital Tunis. and he set us all on fire. The poem is however more than a celebration of the initial collective outcry: . and the road is full of snakes. and there ain’t no going back. Image. 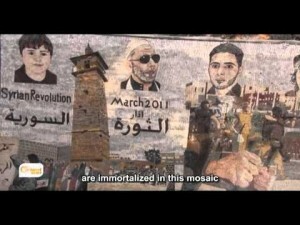 Revolutionary Mosaics in Kafranbel. The “Revolution Panorama“ features the various stages and transformations that the Syrian revolution had undergone. The project, however, had not been without controversy. (watch video). Story. The detail shows Ghiath Matar, a Syrian activist who became known for giving flowers and water to army soldiers. He was one of the first people to organize and lead peaceful protests in Syria against dictator Bashar al-Assad. He was murdered by the regime. (Facebook) Ghiath Matar left a political testament. “The Fallen Protester’s Song” (Full Text, Video, 00.50 –03.80 ) is about Ghiath Matar, a renowned activist who became a symbol of peaceful resistance in the Syrian revolution. He was among those who showed unparalleled creativity in non-violent resistance. In the heat of Syrian summer of 2011 he and his fellow protesters distributed flowers and bottles of water among the military charged with suppressing them. 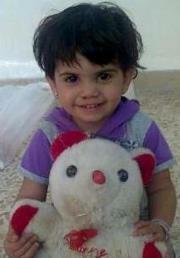 On Sep 6, 2011 Matar was arrested by the national security forces. Four days later, his body was returned to his family with scars and sores resulting from severe torture. “His throat was pulled out and there was a long sewn incision in his abdomen area indicating possible organ theft the Syrian Government Security is known for.“ (Moustafa Jacoub, “In Memory Of Ghiyath Matar“). Ghiath Matar “gave his life to free Syria and with a loving smile to all, even to soldiers, pointing their guns at him; he called everyone to come together to build a democratic state based on justice, dignity and freedom for all“ (Jacoub). I ever lived, my friends. and started giving it away. To anyone. After that, we were free. trying to find the freedom and extract it surgically. long-term, and everybody shrinks, but no one notices. or when the political goal of “freedom for all” is represented in analogy to photosynthesis: plants needing oxygin for growing and human beings needing oxigin to breathe. then, my friends, remember me. The real Matar left a political testament, addressed to “My free and young brothers of the revolution, you who have shared with me the path to freedom during days that were the most beautiful days of my life.“ In it he asked his fellow campaigners to carry on the struggle for freedom they had shared when he was still alive. “(M)y will to you to remain true to the principle we went out for“: “to say no to injustice and tyranny, (y)es to freedom, justice and dignity.“ Kahf’s poetic rendition of Matar’s testament speaks to an external audience. Hence the metaphors that Kahf uses to bridge the emotional distance. Read the last tweets by Ghiyath Matar. 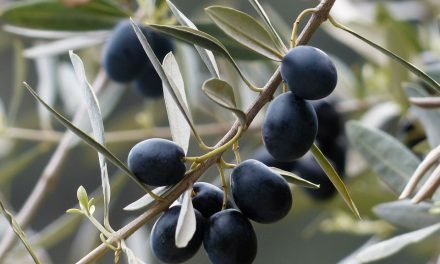 Image: The olive branch is a widely shared symbol of peace. Context: In 1989 a picture travelled around the world. It showed the “tank man”, an unidentified man who stood in front of a column of tanks the morning after the Chinese military had suppressed the Tiananmen Square protests by force. 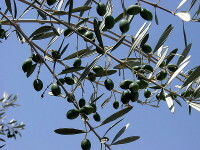 “My people are rising” begins with an image of people “lifting olives and songs”. It then gives detailed information about the uprisings: who took part, where actions took place, what the revolutionary chants were etc., sporadically interrupted by personal remarks. “The earth is big enough for all of us! like the rain in Syria. In “My people are rising” the poem becomes a source of information about the civil rights movement in Syria, its people and participants, represented with Kahf’s known passionate eloquence. More matter-of-fact readers will have to get used to linguistic duplications (the “fresh, fresh tears”, the “big big earth”, the “dark, dark heart”). Image: An ancient ceramic water container showing Hercules and the Lernaean Hydra (an ancient serpent-like water monster). 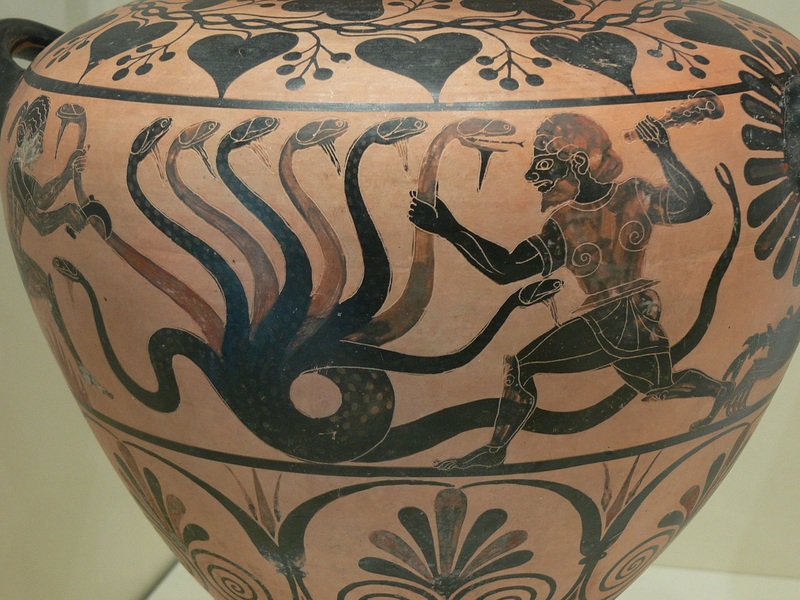 Fighting the multi-headed giant snake was one of Hercules’ labors. First he thought it was easy but then he came to realize that by chopping its head off he was only making it stronger. Context: Kahf adapts the myth to illustrate what to her mind were dangerous developments in the course of the Syrian Revolution. From early 2012 onward the non-violence movement in Syria turned to a mixing of violent and nonviolent resistance thereby jeopardizing people power, particularly when violence became the main driver of resistance. (Bartkowski and Kahf, “The Syrian resistance“) Many protesters saw the only way forward was to meet violence with violence, guns with guns. to keep the revolution clean. in place of its head. are gesturing wildly, as if they owned the scene. tottering, ready for the final swipe. raised high, but reason is the shield. The piece was filmed at a poetry reading and fundraiser event in Los Angeles. (Watch the video on YouTube) Put together by a journalist in attendance at the event, Eve Lyman (Mohja Kahf in a tweet) it interspersed the poetry reading with still photographs as well as sound and video from news reports on Syria. The idea to make Kahf’s poem part of a multi-sensory experience wasn’t a bad idea. However “The Vigil“ talks about a moral dilemma: to stick to non-violent resistance in spite of adversary developments. 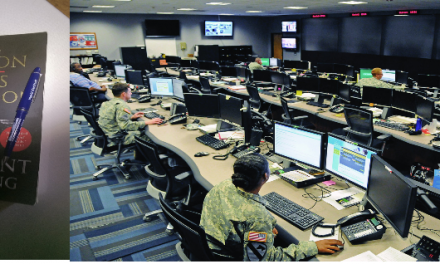 In the multimedia piece this focus risks to get lost. Context: Shortly before she organized “Stand with the Children in Syria“, an awareness and funds raising event as part of a worldwide rally, Mojah Kahf had posted the poem on her Facebook page. (Read full text). a mass of red flesh and nerves spilling from her neck. who thinks lying helps the revolution. “Endgames” might be a hint to “some in the global left or anti-imperialist camp (who) understand the Syrian revolution only through the endgame of geopolitics. 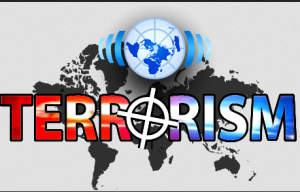 In such a narrative, the uprising population is nothing but the proxy of U.S. Imperialism“. (“Then and Now“). On Sep. 17 2012 a blogger to the Egyptian Chronicles published a comment entitled “#Syria Revolts : A horror that #YouTube could not tolerate“ where he retraced the history of the photo on YouTube. YouTube finally removed the video that documented the war crime. The notice said: “This video has been removed for violating YouTube’s policy for violent and graphic content“. How This Freedom is Built: “The Heave into Freedom“ . 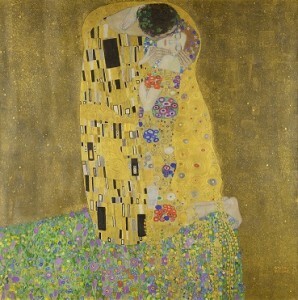 Image: It shows “The Kiss“: Gustav Klimt’s idealistic vision of love (1907/8). The Syrian artist Tammam Azzam superimposed Klimt’s iconic work over the walls of a war-torn building in his native country. The photoshopped image went viral as an unromantic commentary on the Syrian conflict. The image was ‘liked’ by over 20,000 people and shared 14,000 times in only 5 hours. Context: In “The Heave to Freedom“ the narrator meditates on the pragmatical conditions of love and beauty. “This is impossible”? We know it is impossible. to reach most in the world? Image: Detail from a campaign poster of Save the Rest, a grassroots activity to agitate against the regime from the heartland of the nation’s capital. may our love reach you tonight. The narrator reads out a list of detainees, many of them detained under the so-called “anti-terror” laws. (Human Rights Watch, “Syria: Political Detainees Tortured, Killed”.) Some are mentioned by their first names, others by their full names like Yacoub Hanna Shamoun, an Assyrian Christian who had been incarcerated for over twenty years without due process, or Ahmad Thani Abazid, one of the Syrian schoolboys who are said to have sparked the Syrian revolution. … I see your faces, and my eyelids open. The narrator includes those detainees whose families had not received an official explanation for the detention of their relatives or any information regarding their whereabouts. You are free, no matter behind how many locks. Do not think you are not powerful. You are powerful. You are the muscle and sinew of truth flexing. Our hands clasp your hands, pulling. Hold on tight. Writing political poetry is like walking on a tightrope, both components asking their due. What characterizes Kahf’s political poems is that they are multi-layered and ambiguous while simultaneously explicit, through their titles, through the transparency of their settings, through the choice of their communication styles. They reach diverse audiences on a personal level, especially since they retrace the process that led the narrator to a particular awareness, and that the present questions to reflect on rather than answers. Her in the narrower sense political poems. some more convincing than others, show the potent voice poetry can have in the struggle for social justice and political change. Poetry, however unidentifiable and elusive in its abreviated and condensed style, is a kind of consciousness transfer. 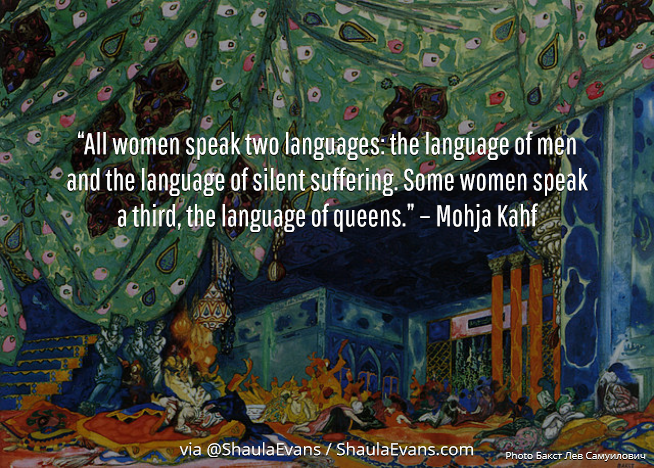 Mohja Kahf’s poems resonate with many audiences. Her poetry – as Hayan Charara put it in 2008 – “offers articulate, passionate challenges to commonplace perceptions” of the Middle East and its people, striking “notes of humor, compassion, outrage and celebration that resonate beyond literary registers.“ Kahf, the poet, favors a form of “direct poetry”: narrative, conversational, straightforward, a poetry that tries to reach its audiences through everyday scenarios or through personal address. This also applies to her political poetry. Her poems are deeply structured. You needn’t reconstruct all layers of meaning, all subteties, intended or not, to like her poetry. Much can be discovered by pure reading, although different audiences will enjoy different sets of poems. What strikes most is Kahf’s honesty and passion. In “Marvelous Women” she describes herself as a poet in terms of a “seamstress” who – without the stories that are brought to her – would be out of work. She makes no secret of her beliefs. As a poet with a dual/multiple cultural heritage she has an advantage over poets who are limited by their parochial view. This is important in our global age. From a stylistic point of view her poetry has been described as an amalgam of both Syrian and American influences (Poetry Foundation) Or, as Lisa Suhair Majaj put it, her work “draws on American colloquialisms and Quranic suras; it is informed not only by American free verse … but also by a lush energy that draws on the heart of the Arabic oral tradition and Arabic poetry.” (Majaj as quoted in Poetry Foundation). That makes it interesting for Syrian as well as a Syrian-American audiences and beyond. Kahf’s uses the art of poetic storytelling as a form of resistance: Her narrator turns into a subversive figure. In line with the historical Scheherazade, who with her ingenuity and linguistic inventiveness saved her and other people’s lives, Kahf’s poems always surprise readers, with twists and turns. Abdelrazek, Amal Talaat. Contemporary Arab American Women Writers: Hyphenated Identities and Border Crossings. Cambria Press, 2008. Al-Samman, Hanadi. Anxiety of Erasure: Trauma, Authorship, and the Diaspora in Arab Women’s Writings. Syracuse UP, 2015. Drake, Richard. “A Conversation with Mohja Kahf“. Arkansas Times (Dec. 15, 2010). Hamada, Doaa Abdelhafez. 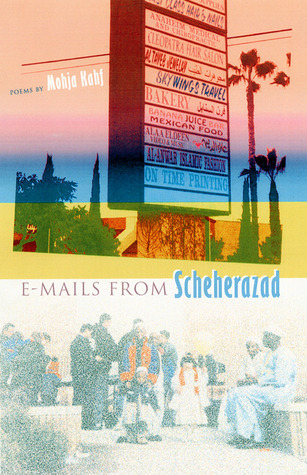 “Arab American Muslim Women and the Experience of Being ‘Irregular’ in Mohja Kahf Email from Scheherazad“. In: Yasser Fouad Selim, Eid Mohamed. Who Defines Me: Negotiating Identity in Language and Literature. Cambridge Scholars Publishing, 2014, 3-32. Judaye. “Hijab Scenes by Mohja Kahf and Poem For Today“ March 22, 2012. Kahf, Mohja. 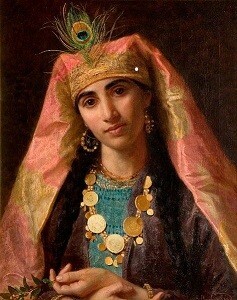 Western Representations of the Muslim Woman: From Termagant to Odalisque. University of Texas Press, 1999. Kahf, Mohja. “Spare Me the Sermon. On Muslim Women”. Washington Post (Oct. 5, 2008). Kahf, Mohja. “Then and Now – The Syrian Revolution to Date: A young nonviolent resistance and the ensuing armed struggle“ (A Special Report from Friends for a Nonviolent World 02-28-13). Kahf, Mohja. “The Daughters’ Road to Syria“. The Rumpus (Dec 19th, 2011). Kahf, Mohja. “Women’s mass protests during the Syrian Revolution: A preliminary analysis“. FOR (October 21, 2011). Kahf, Mohja. “In the Middle of Madness – Four Women March for Nonviolence in Syria.“ Fellowship of Reconciliation (Nov. 25, 2012). Kahf, Mohja. “The Syrian Revolution on Four Packs a Day“. Jadaliyya (Feb 07, 2012). Kahf, Mohja. “It’s Still A Revolution, My Friends”. Fellowship of Reconciliation (Sep 5, 2013). Kahf. Mohja. “Women and Children First: Syria’s Day of Dignity.“ Religion Dispatches. Leatherby, Lauren. “Activism from Afar: The Syrian Revolution From a UA Professor“. The Arkansas Travelor (Nov. 17, 2011). Lyman, Eve Chayes. “Poetic Ammo Against Syria’s ’War of Narratives’”. Aslan Media (26 July 2012). MacFarquhart, Neil. “She Carries Weapons; They Are Called Words.“ The New York Times (May 12, 2007). Pressenza IPA “Women’s mass protests during the Syrian Revolution: A preliminary analysis.” Pressenza (11.11.2011). Stolton, Sam. “Poetry – Syrian Poetry. Revolution, Freedom and Breaking the Old Phantom of Fear.“ Poejazzi (Jan. 31, 2014). Toossi, Katayoun Zarei. 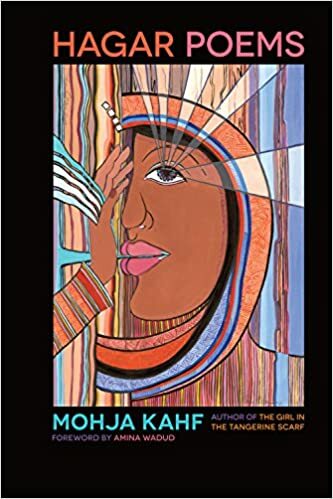 “The Conundrum of the Veil and Mohja Kahf’s Literary Representations of Hijab.“ Interventions: International Journal of Postcolonial Studies 17:5 (2015). Ingrid Kerkhoff. “Bridging Cultures, Building Peace: Mohja Kahf.“ The World Speaks English (Juli 2016).